Anyone who follows my little man, Jake, will know that he suffers from eczema on and off. At times, it flares up uncontrollably and will be incredibly inflamed and angry looking. We have had to strip back the products we use on his skin, in his bath and when washing his clothes. The Doctors are all very friendly and supportive - but apart from prescribing a myriad of creams, potions and lotions, they seem unable to find a definitive solution for us. 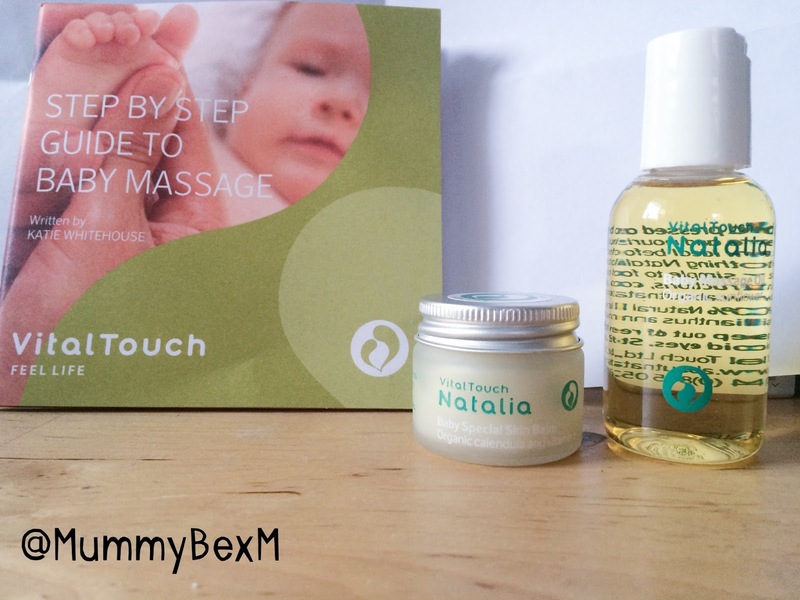 A good while ago the lovely people over at Vital Touch Natalia contacted me and offered to send me some of their Baby Massage Oil and their Baby Special Skin Balm*. Unfortunately, when the products arrived Jake hit a rather nasty flare up of eczema across his entire torso and the creases of his arms and legs - and so I had to postpone my trial until we had gotten his skin under control again. This wasn't because the products are harmful, but rather because some parts of Jake's skin was 'broken skin' and needed careful management. 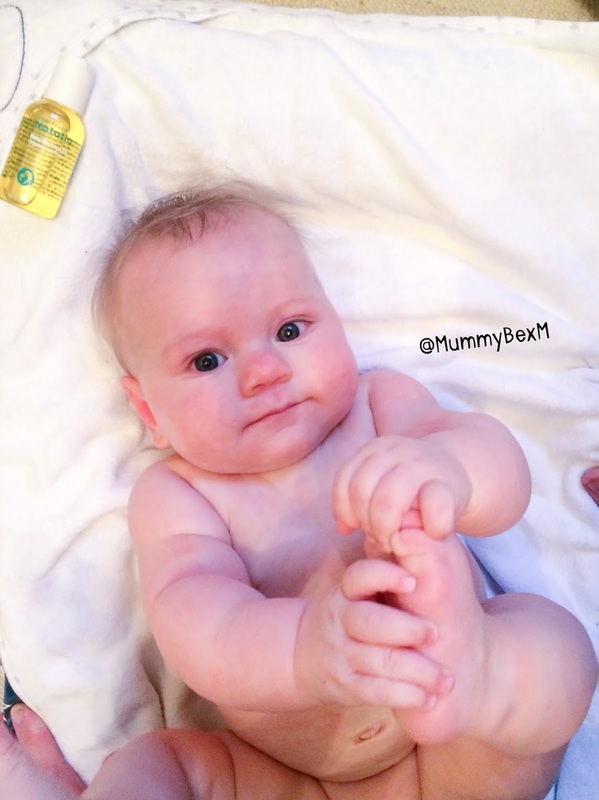 Eventually, his skin cleared and we began using the Baby Massage Oil and following the 'Step By Step Guide to Baby Massage' which was provided. It was wonderful! Learning to massage and soothe Jake after his baths and before his bed time bottle has become one of the best parts of our day. We've discovered that Jake loves to listen to classical music whilst we do this, and has a particular fondness for his toes and the arches of his feet being massaged; I honestly thought it would tickle him, but he loves it! 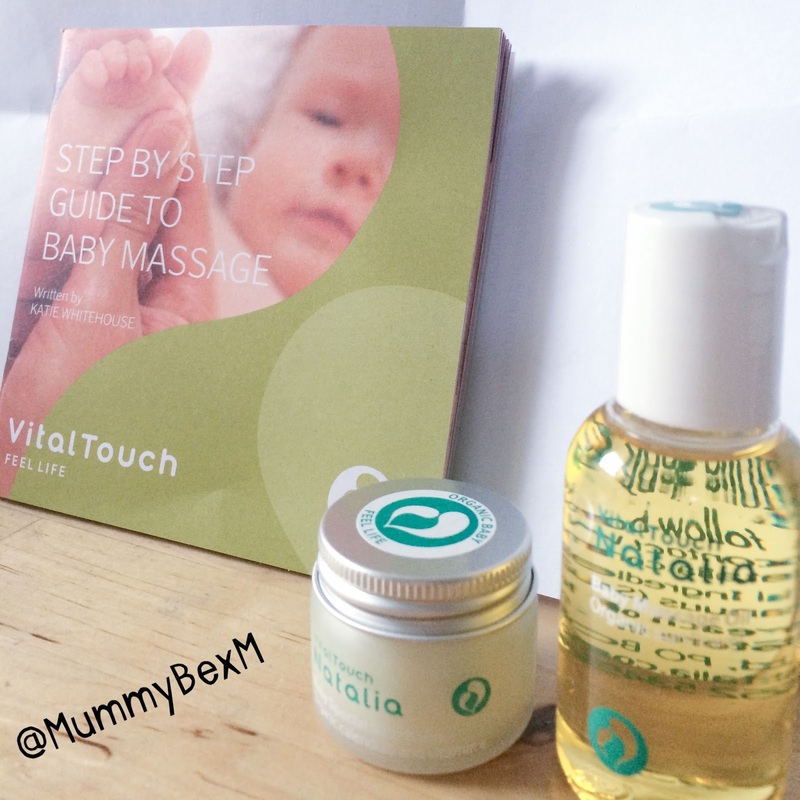 Vital Touch sent us two products and a super helpful step by step guide to baby massage. The booklet was extremely supportive, and reinforced the importance of 'positive touch'. It explains that, 'positive touch is vital for our well being...we all need touch to thrive'. It also goes on to tell us that, 'the consequences of long term touch deprivation are actually profound', and that this can lead to feelings of, 'insomnia, depression, isolation and low self esteem'. I found the guide to be very supportive, as it takes you through how to get started and the different ways and places you can massage your baby. It was insightful, positive and not at all patronising. I now massage Jake daily, and feel very confident when doing so. It is one of our most intimate moments and it has certainly helped us to bond, something I was keen to do as I haven't breastfed Jake since he was a newborn. 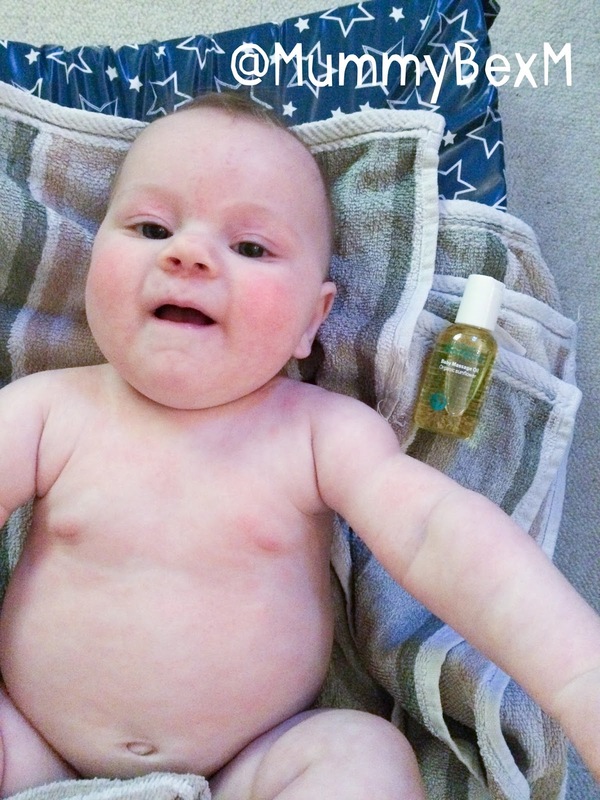 The Baby Massage Oil is made from organic sunflower oil and is 100% natural. The Baby Special Skin Balm is excellent to use on Jake's scalp, when massaging his head and it can even be applied to dry, sore skin - which is perfect for Jake's sensitive eczema prone skin. In all honesty, before becoming a mum I didn't ever worry about using all natural or organic products and foods. Since having Jake this has changed, and even more so since he began to suffer with eczema. It is a risky business having a child with sensitive skin, as the slightest changes in food or products can cause flare ups. So you do have to keep track of what you're using and notice any changes that occur over time. It has certainly been lovely knowing that I can use the baby massage oil and the balm after baths, without worrying about chemicals. Since using these products - it has been over 2 months now - Jake's torso has definitely improved, and we've not had a repeat of the awful flare up we had before. I would, and do, now look for more organic and natural products to use with Jake - including clothing. The Baby Special Skin Balm is fragrance free. But it has a beautifully moisturising feeling and a smooth, buttery texture which feels very soothing on your skin, as well as your baby's. Jake enjoys when I warm this between my hands and fingers, and then work it into his scalp, face and chin. It is especially helpful, as he dribbles a lot with teething and his skin around his mouth and chin can become a little dry and shrivelled. The balm really helps with this, without the greasy or sticky feeling you often get with general moisturisers.We have also noticed a difference with the skin on Jake's scalp - very little dryness and he's never had any cradle cap to speak of. The Baby Massage Oil is fabulous. My husband and I call it sunshine in a bottle, because it looks and smells like you've been outside in a warm, sunny field all day; it's bright, earthy and glistening. I think the Baby Massage Oil is an essential. I will need to order more soon, as we're nearly through with the bottle. It is lovely to use on Jake's skin and leaves our own hands supple and smoothed. We have noticed since using the massage oil daily, that Jake hasn't had any other major flare ups and that he really seems to enjoy the process. Not only has it helped me, but Daddy has been hands on too and I have been able to teach him how to massage Jake so that when he's home and not working late shifts, he can massage Jake too. You can see them enjoying the process together here - there's no question it's a winner! I have been pleasantly surprised by the quality, enjoyment and pleasure that our whole family have enjoyed through the use of these products and I would honestly recommend them to anyone who has children, or is about to. I wish I had discovered Vital Touch sooner, as they offer a whole range of products for during pregnancy and after, as well as products to use with baby. You can find out more here, at their website or you can ask them on twitter - they're very friendly! It's a winner for us and it has been a beautiful experience using these products. Thank you Vital Touch Natalia! He looks like he really enjoys his massage, I did Baby Massage with Loen when she was tiny, have you tried Coconut Oil and Dr Brommers? I use that in her bath as her skin can be terrible.